'The Book of Eli' — is This a Fallout Movie? You may have heard of "The Book of Eli," a post-apocalyptic action tale coming in January and starring Denzel Washington. 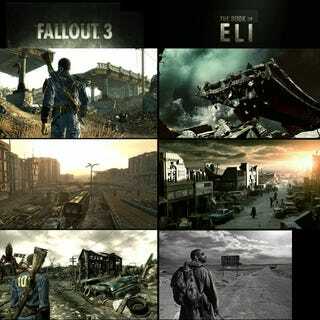 One reader noticed the film's resemblance to Fallout 3. Reader Roger N. put together this comparison. While destruction and ravaged wastelands are motifs, not the story itself, the film does involve a heavily armed badass who walks the earth and is more or less the last, best hope of humanity. Me, I think the most similar thing is the logo typeface. Dessicated overpasses, sure, but we'd expect them after any nuclear war.